*cheesy voice over* Goooood evening ladies and gentlemen (?! ), please, welcome your host, The Camera's Lying to the stage! 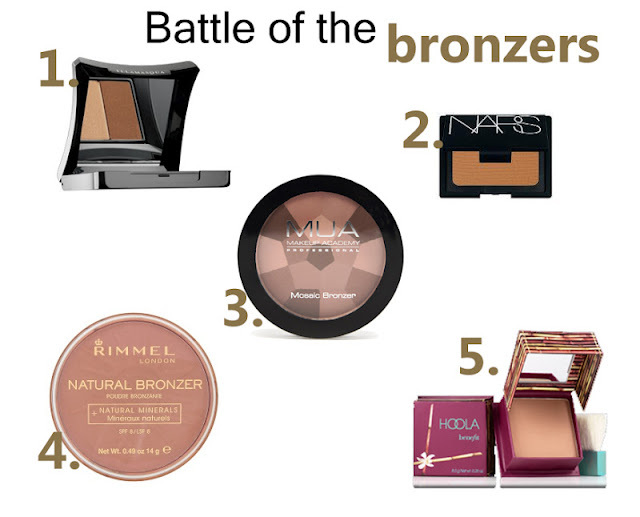 Hello everyone and welcome to The Battle of The Bronzers! For a long time now I've been looking into getting myself a nice bronzer. I'll admit first off, I'm by NO means a bronzer connoisseur. In fact I can count on one hand the number of bronzers I've owned. One finger to be more precise! *Looks away in embarrassment. * But its Spring now, and I'm ready to ditch the 'pasty white chick' look for a more 'straight off the beach' glow. The only issue is, there is so much choice out there when it comes to bronzers, I feel like a tiny fish in a large ocean of golden brown excitement. Luckily, after many a 'monthly favourites' video watching session and copious blogger reviews studied, I've taken a tea cup full of the metaphorical golden brown ocean to put them against each other in a BATTLE LIKE NO OTHER. Well, not really, but its going to help me decide which lucky chap makes its way into my makeup bag and hopefully provide you with some bronzing suggestions. Exude after-dark glamour with Illamasqua Bronzing Duo. Each sun-kissed shade contains crushed pearl powder, for a smooth, even finish that gives face and body a glorious golden glow. Be radiant, be noticed, be a bronzed goddess of the night. Blendable and good for both bronzing (lighter shade) and contouring (darker shade). Lasts all day but is noticeably shimmery. Good longevity. I like that you get two different shades and I love the sleek Illamasqua packaging, however you only get 4g of each shade which isn't much for the price tag in my opinion! Diffused powder with golden shimmer to create an all-over warmth and contour for the entire face.Bronzing Powder creates a natural looking glow which enhances or creates the look of tanned skin. Cult product. Blendable and buildable colour, with a very, very slight shimmer in daylight. Very pigmented but tends to need touching up throughout the day for those with oilier skin types. £25.00 for 8g, eek! However, the finish is more what I'm after than the Illamasqua shimmery offering. I just wish the NARS packaging wouldn't get so damn dirty! Four different shades so when you swirl your brush around in them you get an overall multi-tonal look that brings out the natural tone in your skin. Use a small amount for a natural sun-kissed look or build up the look for a dramatic contour. Slightly more tricky to blend with fingers than a brush, Great for adding glow to face but not a brilliant contour shade due to shimmer. Great value for money. £2.50 for 8.9g? TWO POUNDS FIFTY PENCE?!! I just wish it wasn't so shimmery. This light, natural looking bronzing powder combines colour and protection with SPF8. For an even all over coverage and natural warm sun-kissed glow. Matte bronzer, perfect for fairer skin tones. Authentic 'bronzed' finish which lasts pretty much all day. Dust this soft bronze powder over your complexion for a healthy, natural looking "tan"
pure colour - no sparkle and no shine! Matte bronzer which looks natural when applied. No annoying, fake looking orange undertones you sometimes find with bronzers. Summer staple- if only Benefit would sort out those pesky brushes which come with their boxed powders. 8gs of product for £23.50 is a steep ask, but this is the matte shade I've been looking for and I know I won't end up looking orange. I'm such a sucker for Benefit's boxed powders packaging, too. so cute! Verdict? I think its going to be a toss up between Rimmel and Benefit. Anyone want to lend me some pennies?